Blood circulation - How to expand blood capillaries? Do blood capillaries expand? If yes, through what means can it be done? And can warm water also be used to expand blood capillaries? They don't have any muscular component like arterioles or venules do. 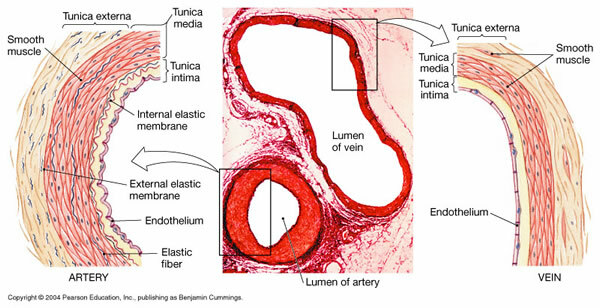 They are lined by a single layer of endothelium (cells lining blood vessels are called endothelial cells) overlying the basement membrane. Due to these reasons the capillaries are very permeable facilitating nutrient and gas exchange. Exposure to heat dilates the pre-capillary arterioles - this would inevitably cause improved capillary circulation in capillaries that are already open. Increase in pre-capillary flow opens up collapsed capillaries. In the human body roughly only one-fourth of the capillaries are open during rest1. 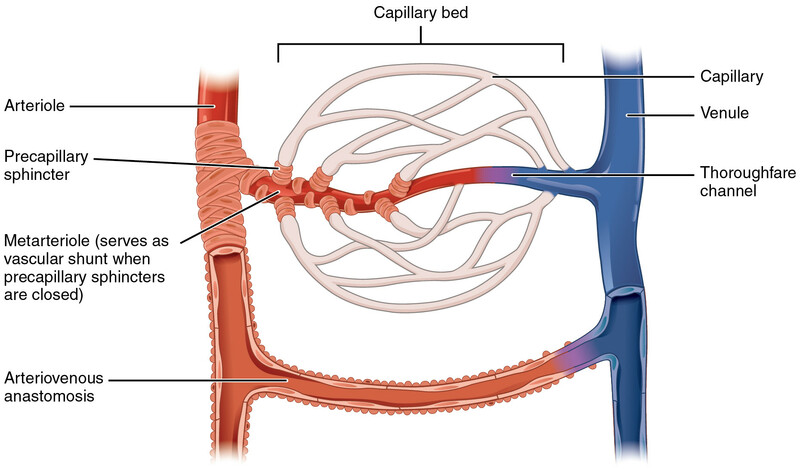 As the pre-capillary arterioles dilate, the collapsed capillaries open up thus further improving circulation. Permanent improvement of capillary circulation can be achieved by increasing capillary density. Capillary density refers to the number of capillaries present in 1 cm2 area. Capillary density can be increased by consistent anaerobic (isometric and to some extent isotonic) exercise. Yes, some blood vessels change their diameter, they dilate or constrict. This is termed 'vasodilation' and 'vasoconstriction'. Large and mid-sized vessels contain smooth muscle in their walls. The walls of arteries tend to be stiffer than those of veins, to withstand high pressure coming from the heart. Smooth muscle, when stimulated by the nervous system, can sustain contractions for long periods of time, and often with fine control. When smooth muscle in the walls of your blood vessels relaxes, those vessels will dilate. Small capillaries do not have smooth muscle in their walls, but the flow of blood through them can be controlled by the larger vessels that feed them. When arterioles constrict, the capillaries they feed can have reduced flow. Our nervous system takes in a lot of signals relevant to controlling blood pressure and flow, and controls these smooth muscles. Flow can be increased or decreased to individual organs when needed, like the intestine (after a meal), the muscles (during exercise), the skin (for heat exchange). The question about warm water is actually quite interesting. Placing your arm in warm water will cause vasodilation in your other arm (the one not in the water), in order to lose some heat to the cold air and maintain your core temperature. Normally, the blood vessels in our 'extremities' (our hands and feet) are kept quite constricted to reduce heat loss with the cold air. If we exercise or take a hot bath our core temperature will rise, some people will notice their skin gain a red hue after these activities, due to vasodilation. Not the answer you're looking for? Browse other questions tagged blood-circulation or ask your own question. 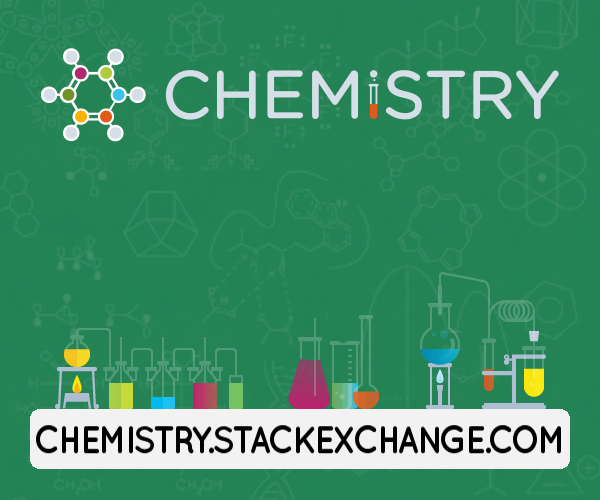 What would happen if blood flow wasn't periodic? How does alum help in blood coagulation? Are new blood vessels able to deliver oxygen to hypoxic tissue before the establishment of blood circulation? How does vasodilation slow blood flow?